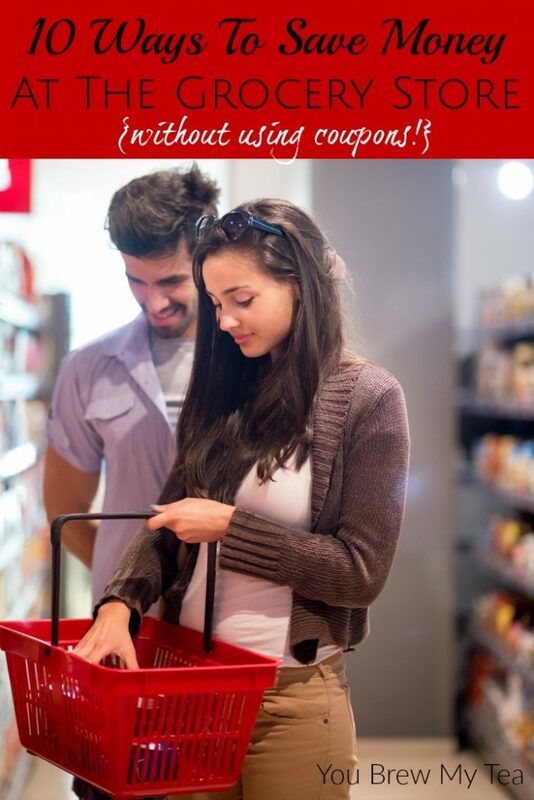 My husband and I have been working hard at staying within our budget, especially when it comes to grocery shopping. 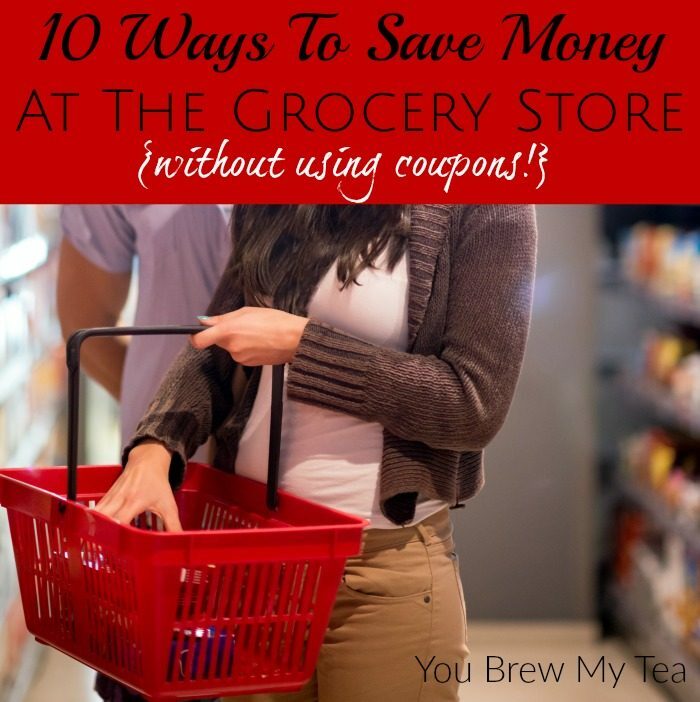 Since this has been an ongoing battle for us, I came up with 10 ways to save money at the grocery store. Recently we began working with a goal of being debt-free in two years. We know that one area we have to get under control is how much we spend on food each month. I’m learning some tricks that add up to big savings and wanted to share those with you. Buy Frozen produce. No matter how much I try, it seems like I always have some waste with fresh produce. One way I’ve learned to avoid waste is to buy some of my produce frozen. Buying organic, especially for the items on the Dirty Dozen list, can get expensive if they aren’t on sale or in the season. A good example of this is bell peppers, they offer a lot of flavor to recipes but can often be one of the most expensive produce items to buy organic. I buy a bag of frozen pepper mix and it can be used for several meals with zero waste. This is easily one of my favorite of the top 10 ways to save money. Shop the Bulk Food Bins. This is a great way to add variety to your menu but most of all it offers you an opportunity to buy the exact amount you need for a recipe. This is helpful with nuts, which can be extremely pricey to buy an entire package when a recipe calls for just one cup. Often, spices are also available in bulk so I like to take advantage of buying just the teaspoon I need for one special recipe. My favorite, though, is buying dry beans in bulk. One pound organic dry beans in the bulk section is often half the price of the already packaged variety. Make fewer trips to the store. This seems simple but can take some discipline. We always shopped once a week but found ourselves wanting something different mid-week and returning to the store for just one item. The problem was we could never go into the store and come out with just one item! We discovered that these return trips were almost always pushing us over budget. Make a List. Whether it is for a day, a week or a month, one key to saving is to arrive at the store with a list. Don’t allow yourself to buy anything that isn’t on your list. If you can manage to sort that list into aisles within your store it is even easier to follow. Bonus Tip: Don’t forget to take your list and go through your recipes and pantry to make sure you don’t already have something in stock, or perhaps are missing a small ingredient. Take 10 minutes to Review Sales Before You Meal Plan. When you stop to make your list, get online and check out what is on sale. Stores will often follow a theme with sale items which makes meal planning easier. For instance, ground beef, taco shells, grated cheese, and tomatoes may all be on sale and together equal an easy taco night. Buy Larger Sizes and Portion at Home. Yogurt, cookies, crackers, applesauce and cheese all fall into this category. Don’t pay more for the packaging, package in reusable containers at home. If your kids are drawn to the individual packages, let them choose a special reusable container or let them help you divide and portion. There are even fun plastic bags you can make your own individual yogurt push pops with! Shop Alone. In most households there is one person who can follow the list and one or more who can’t. If someone is good at following the list and not adding to the cart, send them shopping alone. In our home, I am better at staying on track with the list so it benefits our budget for me to shop alone. Keep Meals Simple. I love to cook and try new recipes but I’ve learned over time that it can get very expensive to buy lots of ingredients for one meal. If you follow lengthy recipes several times a week, that can really add up fast. So, I limit recipes with long ingredient lists to a couple times a month or special occasions. The rest of the time, I choose a meal that is simply meat and vegetables or one that has less than five common ingredients. Buy and Use Less Meat. Not only is this a money saver but it can also be a health booster. Having one meatless meal per week is a great place to start. For picky eaters, remember that cheese pizza counts as meatless! Another way I have reduced meat consumption is by substituting vegetables or beans for a portion of the meat in casseroles, chili, soups or enchiladas. This adds more flavor, gives an extra serving of vegetables and the smaller amount of meat goes unnoticed. Utilize Leftovers. Not everyone is crazy about leftovers and I know they can get boring after a day or two. So get creative and make the leftovers into a new meal. Leftover potatoes can easily be made into twice baked potatoes. Leftover beans can easily be made into bean dip to serve with chips. Oven baked chicken can be chopped up with a little BBQ sauce added and made into sandwiches for another quick meal. Add leftover roasted vegetables to scrambled eggs for a nice breakfast. These ways to save money in the grocery store really help us to manage to eat healthy while sticking to a budget. Share with us some of your favorite ways to save money! I totally agree with all of your tips! Buying (and using) less meat is something I have been doing more of lately. I’ve been replacing meat with beans for a lot of recipes. Thanks for sharing at Merry Monday this week! These are great tips! Thank you for sharing and linking up on Welcome Home Wednesdays Link Party! Finding ways to reinvent leftovers has made a huge difference in reducing our grocery waste. Though I could definitely stand to save some more money. Thanks for the great tips!